A tayuu (high class prostitute) from Shimabara in Kyoto. The area was the licensed prostitution district of Kyoto. 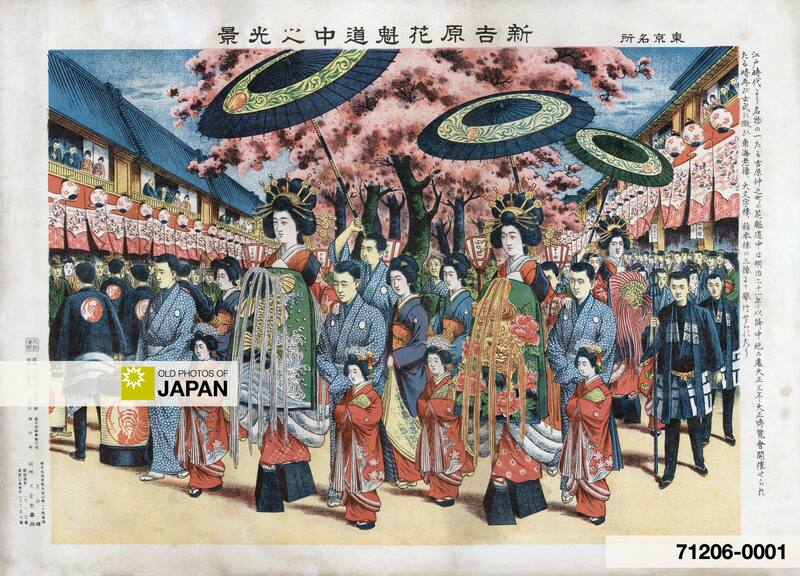 Tayuu wore gorgeous costumes that grew ever more ostentatious during the Edo period (1603-1868). The Tayuu hairstyle distinguishes them from Maiko and Geisha. It was called Hyogo and took hours to get done. The hair in the front had large Bekkou and eight Kougai ornaments. The Ushiro-gami had six pieces of Mae-bira ornaments, Tome ornaments and Hana-kanzashi ornaments. The total could weigh as much as 3 kg (6.6 lbs). Tayuu footwear was as outrageous as their hair. They wore high black-lacquered geta. While geta usually had only two teeth, Tayuu used geta with three teeth when they made their rounds on the streets. Walking incredibly slowly, and moving each foot in a round-about way, they were escorted by a bevy of people and attracted enormous attention (see print of a parade in Yoshiwara). Practicing Tayuu have long since disappeared, but Shimabara counts four women who actively keep the Tayuu culture alive. One of them is Tsukasa Tayuu who tries very hard to revive the Shimabara culture. Prostitution was widespread in Japan during the Edo period (1603-1868). In an attempt to control this, the Tokugawa shogunate designated special licensed prostitution districts (Keisei-machi). Some famous ones were Yoshiwara in Edo (est. 1617)1, Shinmachi in Osaka (est. 1624–1644)2 and Shimabara in Kyoto (est. 1640)3. Shimabara lasted until 1958 (Showa 33) when a new law outlawed prostitution. Very little remains. The Oumon gate can still be seen and the former Shimabara teahouse Wachigaiya, established in the Genroku period (1688-1704), has remained open to serve as a museum of Tayuu culture. It has been designated a Cultural Asset. Another teahouse that survived is the Sumiya. 1 De Becker, J. E. (1899). The Nightless City or the History of the Yoshiwara Yukwaku. Max Nössler & Co.
You can also licence this image online: 70510-0002 @ MeijiShowa.com. Sorry but you need to do a lot more research!!! As a tayuu is not a PROSTITUTE! A Tayuu is an ELITE Geisha. The one that you are thinking of is a Orian which THEY are allowed to sleep with their clients!!! @Jon: Thank you for your comment, but I am afraid you are mistaken. The term Tayuu was originally used in court and Noh, but during the Edo Period courtesans from Shimabara in Kyoto and Shinmachi in Osaka, both well-known brothel districts, started to be called Tayuu. Tayuu were, as you mentioned, highly cultured entertainers and often had the freedom to say no to a client. But they were indeed prostitutes, albeit well-trained in dance, music, and conversation and only available to the upper echelons of Japanese society. Because of this, it is probably more appropriate to call them courtesans instead of prostitutes. But let’s not forget that in Edo and Meiji Period Japan, the concept of prostitution, and indeed the word itself, did not have the negative connotation it has today. 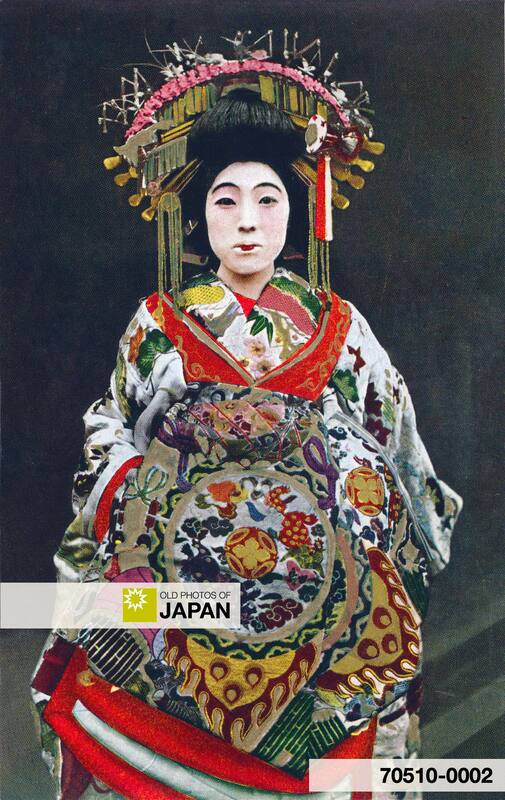 In Tokyo’s Yoshiwara district the term Tayuu was replaced by Oiran around the middle of the 18th century. Incidentally, a small typo crept into in your message. The correct spelling for Orian is Oiran. I think the first commenter (Jon) has confused something. Geisha and Tayuu can not be mentioned together. Geisha were not allowed to sleep with customers. Otherwise kenban banned them from their profession. Tayuu were highly educated and celebrated courtesans, who had the right to refuse a customer. They lived in Shimabara district, Kyoto. Oiran was almost the same as Tayuu, but the term was used in other districts, especially in Yoshiwara district, Edo. I have read that there were other terms for prostitutes, which marked their place in the hierarchy. For example under the Tayuu there was the Koshi-joro, under that the Tsubone-joro, etc. But these names changed very often from time to time and from district to district. You can read more information from “immortal geisha homepage, History of the geisha Part one”. I found there very detailed information about this topic. @Buku3: Thank you. Your explanation is very similar to the one I gave. I’m familiar with Immortal Geisha, a wonderful site!